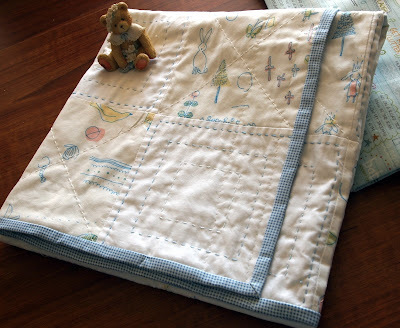 Lurline's Place: For Our New Baby! No, he is not here yet - hopefully very soon, as DS, Aaron is in Thailand with Ooy and I will fly next Friday. As you would expect, I'm anxious and excited. They visit the doctor tomorrow, so maybe some news soon. 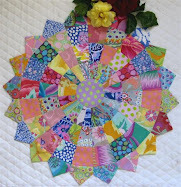 His nibs finished quilt - well almost finished - binding to be stitched, which is one off my in-flight projects. All washed and ready to hold a little bundle of joy. Beautiful soft Yuwa and Emma Louise, it has turned out very soft and cuddly. The last of my roses, as pruning time has come around. It is quite cold here during the nights and we are having gorgeous,sunny days. This is our wet season, so rain must be on its way. I've been having a lot of trouble with Anonymous Posts and consequently Emails, so if anyone has suggestions, please let me know! On the Blog Scene, what is the latest news on Google+ and will we be affected - that's those of us using Blogger - again, please help! Back to the Studio - there's a big tidying session under way. Not my scene at all, but will be lovely to come home to. How exciting!! The quilt you have made looks so soft and beautiful! Those roses are late in the season, they look as though they have a beautiful scent. The quilt is so adorable! I know how excited you must be! There is nothing better than a little one! 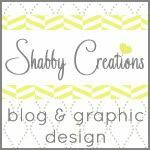 I switched to Bloglovin. It's easy to sign up and it seems like most people are going there. Have a wonderful time snuggling that new baby! 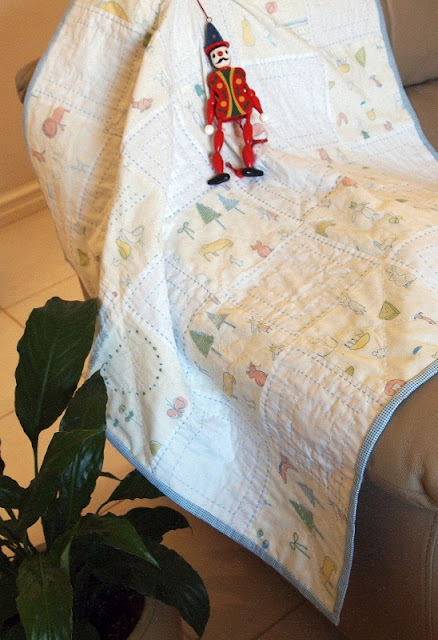 Oh how exciting Lurline...your quilt is so soft and cuddly...Safe travel to you! Bon voyage and travel safely on your journey. HI! Lurline, Your baby quilt is beautiful looks so soft for the new baby,so exciting .Travel safe. I read my blog posts on blogger dashboard . So I haven't done anything .It is staying the same i'm told. Google Reader is going. Gee, I step outside of the world of blogs and look what I miss? I love you baby quilt and congratulations on the grandbaby. Thinking happy thoughts for you and your family.